State Representative Dan Swanson announced the official launch of his Second Annual Summer Reading Club Program for 1st-5thgrade students who live within the 74th Legislative District. 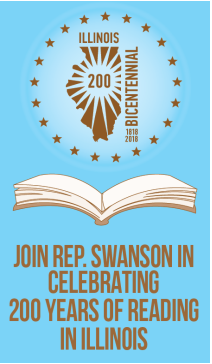 With the Illinois Bicentennial Celebration occurring throughout the year, Rep. Swanson’s theme this year for the program is “Celebrate 200 years of Reading in Illinois”. The program is offered to encourage students to read over the summer and promote the lifelong benefits of literacy. “This is a great way to encourage young people in our region to read over their summer breaks from school. Students who do not read over the summer are much further behind, academically, than their classmates who continue reading during summer break,” said Swanson. Brochures are available below or by calling Rep. Swanson’s Woodhull District Office. Participation in this program can overlap with any other summer reading program offered through area libraries. Participating students have until August 1st to read their eight books and will be invited to a special party upon completion of the program. Attendees of the party will also be given an opportunity to receive information on State and local programs. Completed Forms may be submitted online here.